I’ve previously written a summary on this blog of the reports from 2009, 2011, and 2012. 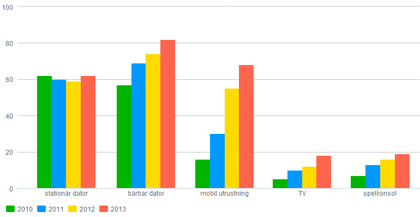 Internet use in Sweden is as widespread as it can be without waiting for demographic shifts. 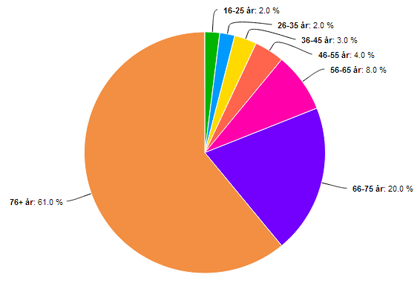 Although there are still some 1.1 millions Swedes “offline”, they are predominantly people in the oldest age groups. 81% of those who don’t use the internet are 66 or older. “Not interested” is by far the main reason. There are a number of usage areas where it’s reached a point where you can safely say “all Swedes” and mean it. Then there are some areas where you need to narrow the age demographic down a little bit before you can be quite so bold. If we consider “almost everyone” to be 90% or higher, and “everyone” to be 97% or higher, then we can say that almost everyone with internet access..
Everyone between the ages of 9 and 44 in Sweden has used the internet at some point and almost everyone between the ages of 45 and 65. Almost everyone online between the ages of 16-25 uses Facebook, and uses it daily. Last year you could says almost everyone between 12 and 25. The 12-15 age group has seen Facebook use fall by 5 percentage points to 86%. Just bubbling under (with around 8 out of 10 doing these things occasionally) are logging into online banking, paying bills, and buying products and services online. Mobile internet use by age group. Green is 2010, red is 2013. The mobile tipping point in Sweden came in 2011 (most specifically, it came in the second half of 2010). The number of people using the internet via mobile devices had been reasonably constant at just a few percent until 2010 when the younger generations started to get online via their mobiles. In 2011 overall mobile internet use jumped from 22 to 36%. It jumped again to 54% in 2012 and in the 2013 report it’s reached 65% of the population (over 12 years old). 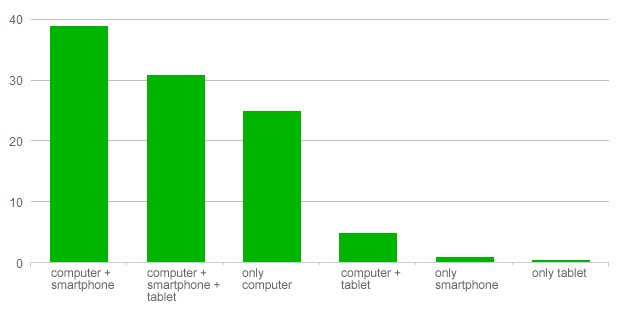 Tablet use by age-group. Daily (blue), at some point (green). The use of tablets shows an interesting pattern. 1 in 3 Swedes have access to a tablets, up from 1 in 5 last year. They have become the defacto way of accessing the internet for 6-11 year-olds. It’s also contributed to a further lowering of the “online age” with 45% of 2 year-olds having used the internet. 16-25 year olds though aren’t so interested in tablets… it’s smartphones for them! We also hear a lot of talk generally about the death of the “desktop” and how mobile is replacing traditional computers (desktops and laptops) as the default way to access the internet. This is certainly true in certain countries and certain demographics, but not so in Sweden. We’re in a multi-device world, but the traditional computer is still generally the hub of our online activity and it is the device of choice for many activities. Multi-device Sweden. 75% have at least a computer and smartphone/tablet. 25% have only a computer. Looking at various activities and the device most used to perform that activity, “mainly mobile” or “only mobile” are never the largest segments, whereas “only computer” or “mainly computer” is the largest segment for both gaming and streaming TV. For the majority of activities surveyed, “both” (computer and mobile) was the largest segment. The rise of the laptop? Availability of devices for accessing the internet. The availability of internet access via desktop, laptop, mobile, TV and game consoles has all risen in 2013 compared to 2012. Even desktop, which had previously fallen in 2010 and 2011 has rose again this year. We increasingly switch between devices. It’s a case of using the device we can when we can, and switching “up” from touch-based devices to more traditional keyboard and pointer based computers when a task becomes awkward..
Those who own smartphones and tablets are seemingly in love with them, but our long term relationship with laptops and desktops hasn’t come to an end quite yet.